If SpaceX founder Elon Musk felt like winning the Super Bowl when the Dragon (perched atop a Falcon 9 rocket) finally launched on Tuesday, he must be absolutely over the moon now. At 9:56 AM Eastern this morning, astronaut Donald Pettit coaxed the International Space Station’s gangly robotic arm into grabbing the unmanned Dragon capsule, marking the first time a private spacecraft has docked with the station. “Looks like we’ve got a Dragon by the tail,” Pettit said. The move elicited plenty of hugs and handshakes both at NASA’s mission control facility as well as SpaceX’s operations center in Hawthorne, California. That initial burst of elation has passed though, and for the past hour the astronauts aboard the space station and their ground crews have buckled down to get some more work done. That historical grapple maneuver was only the first part of the process. 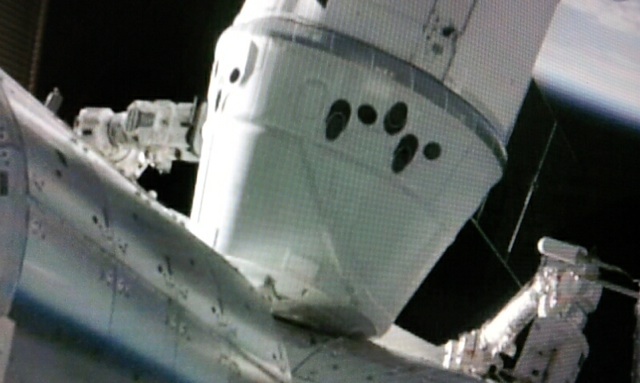 Over the next few hours, the Dragon capsule will be manipulated and berthed along the station’s Harmony module. From there, power and data cables will be connected up to the capsule, and the crew will begin the process of unloading nearly 1,000 pounds of consumables and clothing. Once they’re finished unpacking, the Dragon will be loaded up with nearly 1,300 pounds of cargo — think spacewalk hardware and crew preference items that no longer serve a purpose aboard the station — which will touch down in the Pacific Ocean when the Dragon returns to earth later next Thursday.